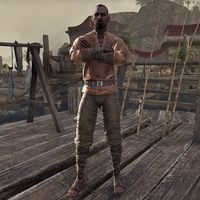 Adal is a Redguard fisher found on the Sentinel Docks after you clear the Ra-Netu by completing the quest Risen From the Depths. He fishes at the four-way intersection directly north of the stairs leading to the city. He will be surprised at the number of undead that came from the water: "Tu'whacca's breath, how could we have left so many bodies beneath the waves for this long? Had we cared for our honored dead properly and buried them, none of this would have happened." This page was last modified on 26 July 2018, at 04:44.